BasicGrey has long been one of my favorite paper compaines. Their designs are so unique and varied...so much crafting you can do with BasicGrey papers and embellishments! 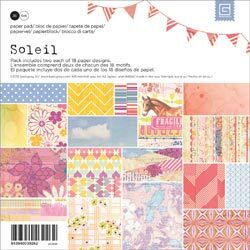 This week I'm happy to announce that we have their new line, Soleil, in stock as well as the coordinating buttons and brads. Here's a bit more about BasicGrey, as told by the company...(I love their description of their products!) You can see samples of projects created by our design team, using BasicGrey products, here and here. Deliciously different. Ambitiously diverse. Remarkably distinct. That’s BasicGrey. Originality is the backbone of every item we design, every product we manufacture, and every angle in which we approach a new project. We strive to set the standard, not follow the trend. We’re the bar to be measured by and the company to watch because we’re one-of-a-kind. BasicGrey remains true to its popular avant-garde style, offering artists exceptionally innovative designs and products. We live art—on the edge, in uncommon ways. And this week only...save over 50% on BasicGrey embellishments! Purchase a BasicGrey paper pad and receive buttons or brads for only $2.00 more! Use code BG912 when checking out! Note that this offer is only good on one bundle per order. Coupon expires on 9/25/12 or when supplies run out!